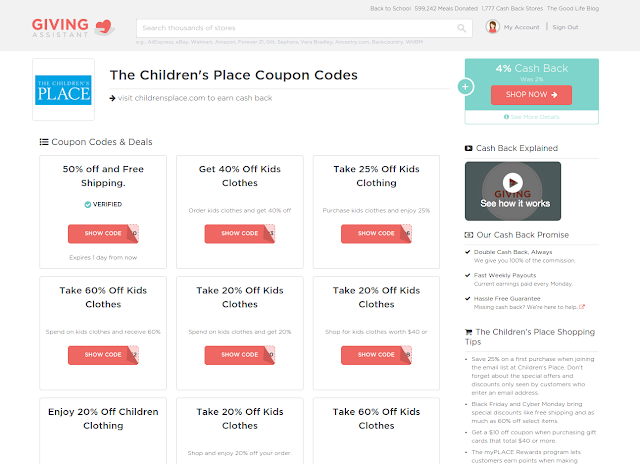 Britney Dearest: Earn Cash on Back to School Purchases With Giving Assistant! Earn Cash on Back to School Purchases With Giving Assistant! This sponsored content, however, I'm sharing my honest review and opinions based on my personal experience with Giving Assistant. As a mother of three busy children, it's very convenient for me to shop from the comfort of my home. I love to save and earn money on every purchase I make, when possible, so I'm no stranger to cash back sites. Recently, when I learned of Giving Assistant I wanted to give it a try. Giving Assistant is a for-profit business created to socially impact the world. 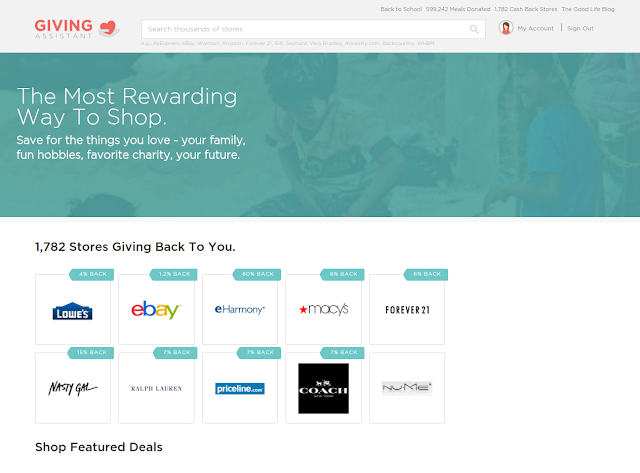 In addition to giving shoppers the opportunity to earn money on online purchases, Giving Assitant offers shoppers the opportunity to partake in charitable actions by offering the option of donating earnings. Here's another perk, not only are earnings donated, but with each qualifying purchase through Giving Assistant, a meal is donated to a needy family. So far, they have donated over half a million meals. Awesome, right?! Giving Assistant has over 1,780 stores to choose from, many of which are the perfect sites to visit for back to school shopping such as Walmart where you can earn 4% cash back on your purchase and JCPenney, where you can earn 3% cash back. Step 1: You visit GivingAssistant.org and sign up. Step 2: Use the search box to find the retailers of your choice. Step 3: Select "Shop Now" to be redirected to the retailer's site. Step 4: Shop 'til you drop and once your checkout process is complete, wait for the funds to be credited to your GA account! Giving Assistant also shares available coupon codes on each individual store page. After your funds are credited Giving Assistant gives shoppers the choice of receiving their earnings or donating their earnings to charity. If you chose to pocket your earnings you can receive your money through Paypal, direct deposit, or have a check mailed to you. Earnings are paid out every Monday. I recently made my first purchase through Giving Assistant at The Children's Place to purchase clothes for this school year for my children and I was very pleased with the simplicity of the process.